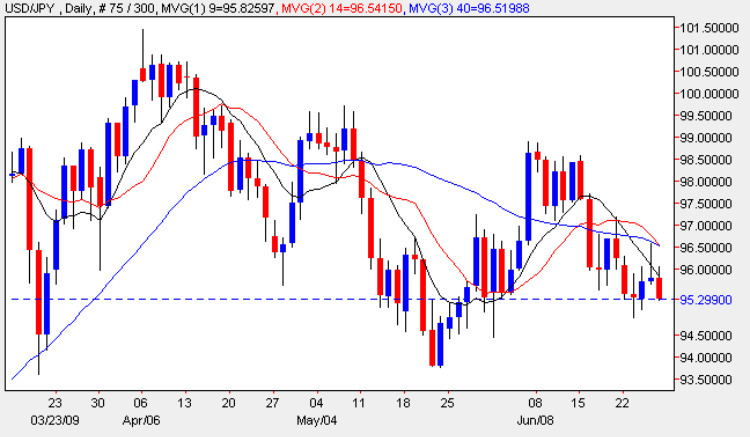 Yesterday’s candle on the yen to dollar chart added a decidedly bearish flavour to the sideways consolidation of the last few weeks which are increasingly showing a tendency to drift towards the downside, a view reinforced by yesterday’s high which found the 40 day moving average to be an impenetrable barrier. The candle on the daily chart closed the session with a deep upper wick and narrow body suggesting the US Dollar bears were in charge. This sentiment has followed through into today’s trading session as we creep ever lower to the 94 price level which remains the key downside target for any confirmed break lower. With the 14 day about to cross below the 40 day moving average we may now be seeing the start of this move lower, but, and it is a very big BUT, until we see the break outlined above nothing is for sure in this slippery pair. If you must trade today then I would suggest trying to find very small short trades using the 5 min chart aiming for small profit targets and using very tight stops. All the fundamental news on the economic calendar for the US is covered on the Eurodollar site whilst for Japan the overnight news included Tokyo Core CPI which came in worse than expected at -1.3% confirming record deflation as demand falls further, National Core CPI which came in on target and finally All Industries Activity which came in 0.3% ahead of forecast at 2.6%.